A team of Northwestern undergraduate students enrolled in Design Thinking and Doing designed Honeycomb, modular and multifunctional furniture to optimize study spaces on campus. Honeycomb has two primary components, a table and a study pod, that can be adjusted to meet the needs of college students. Honeycomb consists of two complementary furniture designs: the Study Pod and the Table. The Study Pod has a sliding door so the users can adjust their level of privacy. A transculent wall allows others to know if the Pod is occupied. The Study Pod includes a dry erase surface. The Honeycomb Table can be moved. The Honeycomb Table can also be combined with other Honeycomb Tables. The Honeycomb Table can be transformed into a standing desk. The dry erase surface encourages brainstorming. Students can store their belongings in the base of the Honeycomb Table. The Honeycomb Study Pods in a cluster. The Honeycomb Tables in a cluster. Team member Joanna Ko described how the team initially uncovered the opportunity that led them to design Honeycomb. The team conducted user observation to help them better understand the human need for study spaces on campus. The team collected user feedback from students by interviewing them while they experienced foam-core prototypes and by conducting an online survey. The team found twenty-four unique reasons that people are unhappy with current study spaces and identified the three factors that students consider most when choosing a study space: noise level, workspace size, and the ability to work alone or collaboratively. “One of our most influencing a-ha moments was realizing how useful the hexagonal shape was, and how that could be integrated into making the product multifunctional while usable at the same time,” said Ko. The team continued to iterate and improve the design through further rounds of testing. They even tested the dimensions of what became the Honeycomb Table and Study Pod by using yarn and large pieces of paper. 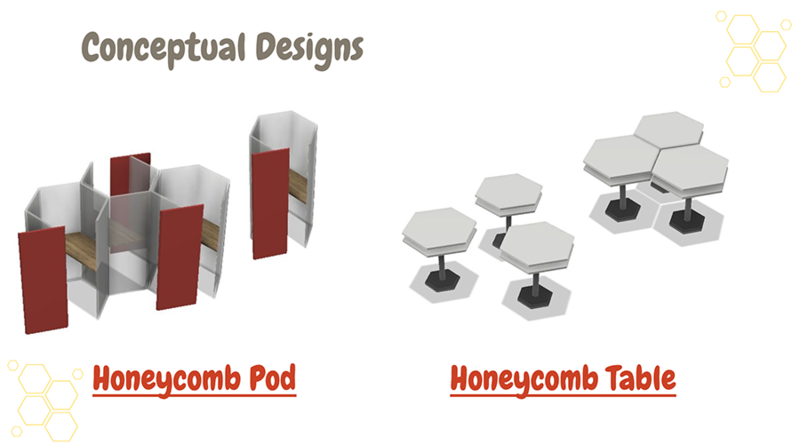 Honeycomb is actually two distinct and complementary furniture designs: the Honeycomb Study Pod and the Honeycomb Table. The Study Pod offers a private study space with a sliding door, translucent wall, and dry erase board. The Table is mobile, with an option to step on the base to lock the caster wheels. The Table also includes storage space in its base and its height can be adjusted to transform it into a standing desk. “Refining details, such as the Honeycomb table’s wheel locking mechanism to the dimensions of the study pod, required several rounds of user testing and further ideation,” said Liu. Collaboration is a key aspect of the designer's mindset and this team attributed their success to effectively working together.